Today I found out why red meat turns brown when cooked. This is thanks to a protein called myoglobin, which also is what makes the raw red meat look red, not blood, as many people think. Myoglobin is a protein that stores oxygen in muscle cells, very similar to its cousin, hemoglobin, which stores oxygen in red blood cells. This oxygen store is necessary for muscles which need immediate oxygen for energy during continual usage. So how does the myoglobin end up making the meat turn brown when cooked? This darkening effect is due to the oxidation state of the iron atoms in myoglobin. When the myoglobin is exposed to oxygen, before you cook the meat, the iron atom oxidation level is +2 and it is bound to a dioxygen molecule (O2), which makes the meat appear bright red. As you cook the meat, this iron atom loses an electron and goes to a +3 oxidation level with this process ending up turning the meat brown. White meat, on the other hand, doesn’t turn dark brown like red meat because it has significantly less myoglobin in it. In fact, the myoglobin levels are actually one of the main factors that officially distinguish white meat from red meat. Contrary to popular belief, “searing” meat does not in any way “seal the juices in”. 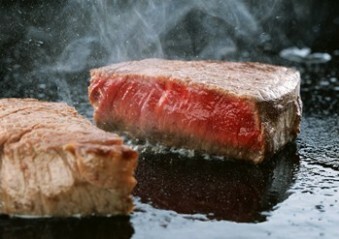 Water in seared meat evaporates at either the same rate or a higher rate, in some cases, than non-seared meat. What searing does do is play a role in browning, which can affect the flavor. But, in this case, the browning is caused by caramelization of sugars combined with a chemical reaction with amino acids and the sugars. When red meat is kept in the refrigerator for more than about a week, it will typically start to turn brown as well; similar to when you cook it, this is also due to chemical changes in the myoglobin. This doesn’t necessarily mean it has gone bad though. Typically a quick sniff will tell you if it’s still good or gone bad at that point. Beef that is vacuum sealed, thus not exposed to oxygen, tends to be more of a purple shade. Once the meat is exposed to oxygen, it will gradually turn red over a span of 10-20 minutes as the myoglobin absorbs the oxygen. The weird “rainbow” colors you may occasionally see on meat, particularly cured meat, called “birefringence”, are caused by the light reflecting off a cross section of cut muscle proteins, specifically myofilaments, which are strands of muscle proteins. These resulting rainbow colors are a bit like what happens when white light shines through a prism, but in this case, through proteins.